The actual beginnings of the plan to build the hospital, which had long been a desire of Dr. George S. Gerhard, an Ardmore physician, took shape at a tea party hosted by Mr. Rodman Griscom of Merion Square. After some initial fund raising, they then applied for a charter in January of 1892. It was duly accepted and incorporated two months later. Bryn Mawr Site. Next, from the initial contributions, was the purchase of a two acre lot on the corner of Bryn Mawr Avenue and County Line Road from C. Warner Arthur for $7,900. This location was chosen because Bryn Mawr was a favorite town for people from the city to visit in the summer. The Bryn Mawr Hotel, the Summit Grove Hotel, the Buck Tavern and the Whitehall Hotel were some of the best known establishments in the area. The generosity of the members of the community was exceptional and the actual construction of the hospital was oversubscribed. It must be noted, in addition to cash gifts, many generously donated various hospital supplies to outfit their new institution. Photo c. 1900 of the first Bryn Mawr Hospital, established in 1893, designed by Frank Furness. A Furness Classic. The new building, designed by Frank Furness, was ultra-modern with an elevator and electric lights. Henry Frorer’s construction firm used native gray stone in the construction of this important addition to the Main Line. When the hospital opened, Dr. George S. Gerhard and Dr. Robert C. Gamble were in charge of the public’s needs. In 1905, a medical laboratory was installed and a school of nursing opened. Today, the Gerhard Building, the first Main Line hospital for the general public, stands surrounded by new and larger buildings that make up the Bryn Mawr Hospital complex with its multitude of up-to-date medical services. Rare 1890s photo of a horse-drawn ambulance. 1920s view of a ward in the Bryn Mawr Hospital. 1947 rendering of the Bryn Mawr Hospital complex. c. 1980 view of the Lankenau Hospital complex. In the mid 19th century, the economic and political turbulence in Germany which followed the Napoleonic Wars prompted a flood of German migration to Philadelphia. Many of the immigrants arrived ill, penniless, speaking no English. The German Hospital of the City of Philadelphia was chartered in 1860 to provide a place where the German speaking populace could be treated by persons speaking their own language. Deaconesses from Germany. Also imported from Germany, in 1884, was a band of seven Lutheran deaconesses to take charge of the hospital’s household and nursing service. Trained at Kaiserswerth (where Florence Nightingale also received her training) the deaconesses soon earned for the hospital a reputation for superior nursing care. Philadelphia Sites. The first home of the hospital was a converted residence at 20th and Norris Streets. In 1872, it was moved to its second location at Girard and Corinthian Avenues. By the turn of the century the hospital occupied an entire city block. The name changed in 1917 to honor John D. Lankenau, a German-born Philadelphia merchant, President of the Board for 27 years and a longtime benefactor. Move to Lower Merion. By the mid 20th century, the hospital plant was aging; it was necessary to rebuild or relocate. Relocation was the choice; the 93 acre Overbrook Golf Club was chosen as the site. In 1953, the hospital moved to Lower Merion and into handsome new buildings which won a first place award in architecture for the designer, Vincent Kling. Lankenau today is first among its peers in patient care, education and research. John D. Lankenau in an 1889 photograph. Sister Amelia Schaeffer, head of the Nursing School, consults with Ada Mutch, Director of Nursing Services. Nurses congregate at the new building, mid 1950s. The Col. Owen Jones Fife and Drum Corps, Bryn Mawr, c. 1903. Suburban police and fire protection have always been led by the concern and kindness of local volunteers. Herewith, a charming collage of photographs from the Society’s collection that seem to show their spirit and camaraderie years ago. Lower Merion’s police force, established in 1900, wore Spanish war hats and uniforms. They got around on bicycles and on horseback. Photo c. 1904. In 1901, space was leased from the Merion Fire Company for a lockup in the rear. of their Lancaster Avenue firehouse. The escape, in 1904, of a prisoner led to a scandal that involved their police chief. A big parade, winding through Lower Merion, was held on June 1890 to demonstrate the emergence of the Merion Fire Company. This 1905 photo shows their headquarters in Ardmore. The volunteer Merion Fire Company of Ardmore poses for a photographer c. 1907. The Lower Merion Police, Department, c. 1910, gets wheels! 1914 photo demonstrates the company’s Simplex Machine. The Merion Fire Company relaxes on July 4, 1916. The Merion Fire Company parades in 1915. The Township Police Force with autos, 1926. The first all-Eagle Scout Patrol in America, led by W. Lawrence Saunders II, standing at center, in October 1914. Flanked by, from left: Alexander H. Holcomb, Jr., Joseph H. Keefe, John Winters, John Rinkenback; seated: Isaac Kershaw,Jr., Harry Ingram, Harry Pierriera. Citizenship Through the Years. Troop Bala One has a long and glorious tradition in both the Boy Scout movement and the Lower Merion community. In 1907, General Robert Baden-Powell, an English Army officer, took a group of lads to Brownsea Island, England. This was the first Boy Scout Camp. In 1908, he wrote a book called Scouting for Boys which had an international, instantaneous impact. Troops and patrols sprung up in England and, shortly thereafter, in Europe. An Unofficial First. The Boy Scout movement was slower to transition to the United States, except in the tiny town of Bala, Pennsylvania. Here, in 1908, a group of community leaders, headed by insurance executive Frank Sykes, organized America’s first group of boys under the principles of scouting as set forth in Baden-Powell’s book. Troop Bala One thus became the first unofficial Boy Scout troop in the U.S. The national umbrella organization, The Boy Scouts of America, was officially organized in February 1910. The following year, Troop Bala One was officially inducted with the alternate name of Troop 16. At that time, President William H. Taft was Honorary President of the Boy Scouts of America and former President Theodore Roosevelt was Honorary VP. Troop Bala One scout camp scenes; formation, c. 1912. First Aid training, c. 1930s. Mr. Saunders is now remembered as the dedicator of the beautiful Saunders Woods, a Lower Merion park in Gladwyne which is used to this day for Cub Scout and Boy Scout camping. The Early Years. During World War I, troop activities became limited as both older scouts and leaders were called to serve their country. During the Depression, the troop endured although camping trips had to be limited because of lack of equipment. During World War II, Troop Bala One was continually involved in projects and services to aid the troops overseas and their families at home. Continuing Activities. Troop Bala One still maintains an active schedule of camping, canoeing, backpacking and educational outings. The troop still carries the torch, lit by Baden-Powell and followed by the early local leaders, to promote personal growth, leadership, fun, safety and self-reliance in outdoor settings. The Beginnings. Education expanded beyond the walls of the Lower Merion Academy into the community when, in 1842, the Trustees established the Lower Merion Library Company which resided in the third floor Committee or Library Room. In 1876, the entire collection of 1,400 volumes was relocated to the Union Sunday School building. With the construction of the Cynwyd Elementary School in 1914, students transferred from the Academy into their new building. The Union Sunday School was removed, leaving the library without a home. The entire collection is now with the Lower Merion Historical Society. Libraries Today. There are six community-based libraries which service the Lower Merion Library System. Their histories parallel the social customs of an era in which women’s clubs and volunteerism figured prominently in the promotion of library endeavors. Ardmore Free Library. Pictured in this 1910 photo was the second home which was located in the YMCA building on Lancaster Pike. Ardmore Free Library now resides on Ardmore Avenue. The history of The Ardmore Free Library is bound to that of its loyal benefactors, the Women’s Club of Ardmore. In 1899, the club rented a room in the old Merion Title and Trust building and equipped it with a library not only for the use of club members, but for the community. Bala Cynwyd Library’s early home was in the Union Fire House. After 47 years at their next home on Levering Mill Road, the library relocated to Old Lancaster Road in 1974, where it continues to serve the community. The Bala Cynwyd Library began in 1915 as an ambition of the Women’s Club of Bala Cynwyd. Since space was not available at the Academy building, the Bala Cynwyd Library Association used part of the Union Fire House as their home. Ludington Library.1927 photo, when it was dedicated by Charles H. Ludington to the memory of his wife, Ethel Saltus Ludington. In 1916, Bryn Mawr witnessed the emergence of the Community Center Library which was located in the old Public School building on Lancaster Pike. Ludington Library, today, is the main branch of all the community-based libraries. Penn Wynne Library. It’s first home was on the corner of Henley and Manoa Roads from 1929 to 1949; it then moved to its present location on Overbrook Parkway. The Penn Wynne Library dates its beginnings to a 1929 donation from the Penn Wynne’s Women’s Club. Gladwyne Free Library. Early interior view; note basketball markings on the floor. The chest in the right foreground housed the children’s collection. The Gladwyne Free Library opened its doors in 1930 at the front of the Gladwyne Community Building. This library is the only one to have remained in its original location. Belmont Hills Library. Its forerunner was the Bird Library, located on Ashland Avenue from 1941 to 1969, when the library was moved to Mary Watersford Road. Belmont Hills Library. In 1935, three women opened a library in St. Andrew’s Chapel. Named West Manayunk Free Library, it was a branch service of the Bala Cynwyd Library run under the auspices of the Girls Friendly Society. In 1941, the library moved and was renamed. Founders of the Society were Edward H. Snow, principal of the Ardmore Junior High School, John M. Nugent, staff writer for the Philadelphia Evening Bulletin, and Douglas C. Macfarlan, M.D., ear/nose/throat specialist. In October 1949, eighty-five citizens of the Township were invited to hear State Historian S.K. Stevens praise their enthusiasm for the preservation of local history. They organized in time to celebrate the fiftieth anniversary of Lower Merion as a First Class Township. Principal missions of the Society are the collection and preservation of records, artifacts, evidence of the past and to educate young and old about local history. 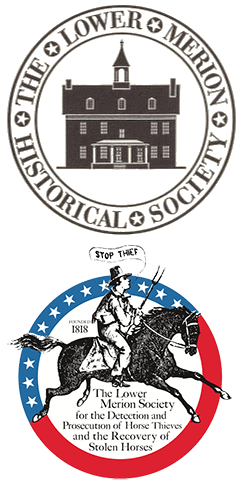 The Society regularly presents programs and events featuring speakers and visits historicplaces in the area. Each year the Society provides, without charge, special talks and bus tours for school classes, and cooperates with students of all ages in research. Journalists and home owners use the growing library of the Society to find background material on property, institutions, events in the Township as well as neighboring Narberth. The library is housed in historic Ashbridge House, Rosemont. Two histories and a study of architectural treasures of the region are Society publications. The Lower Merion Historical Society lives up to its promise…to preserve the memory of the past. “Lower Merion gave me, and our very close family, a sense of roots and community for which I have always been grateful. We had only two homes: a row house on Kenilworth Road in Merion and then a small but freestanding house at 228 Avon Road in Narberth, where my maternal grandparents lived. Each street was a community. At Kenilworth, we played on the street and awaited the daily arrival of the man who delivered ice and the popsicle man, Louie. We used the great open space of nearby Shortridge Park to sled in winter. Avon Road was a real community that led from the large Scheffey estate (in the 18th century, Joseph Price’s Locust Hill) where everyone played, to the center of Narberth where almost every day we went into Davis’ store. The Philadelphia Athletics were in decline and the Phillies had not yet risen from the cellar; so we idolized the Narberth baseball team as it took on the rest of the Main Line League. We particularly liked the 55-year old first baseman who specialized in getting cheap hits into the willow tree that hung over the field just beyond first base on the old Narberth playground. My father was perpetual Judge of Elections at Merion School and my greatest teacher. He filled No. 228 with used books from Leary’s store; and my mother was the heart of the Avon Road community. Whenever a new family moved into the neighborhood, she baked a loaf of bread for them. My parents’ remains lie in All Saints Church in Wynnewood, which played a major part in my life…as did a host of teachers in Merion School, Bala-Cynwyd and Lower Merion High.